The FZR was designed with performance and speed in mind. Don’t expect to find any rod holders or depth sounders on this baby, although I’m sure you could fit her out for fishing if required. Within the front hood is a lift-up storage locker, accessed via a locking button, providing dry storage. Additional storage is available inside a glove box located in front of the handlebars, with beverage holders and a dry canister under the rear seat. The body is constructed with NanoXcel, a lightweight, high-strength material that reduces the weight of the hull, deck and liners by 25 percent. It also imparts a shiny, gem-like finish, reducing drag with enhanced performance as the result. Analogue gauges are set into the dash. The digital readout in the centre displays the fuel gauge, hour/volt meter and the oil, water temp and engine warning lights. Twin rear-view mirrors are mounted on either side of the dash. The handlebars feature adjustable height. Located on the left handle is the trim system, allowing the rider to adjust the bow angle to suit the conditions, and on the right is the throttle. Reverse, with traction control, is engaged by lifting the handle in front of the seat. The seat is ergonomically designed and able to take two riders. At the rear is Yamaha’s trademarked Visibility Spout, a safety feature for riding in rough water so other water users know you’re there. Good quality non-slip rubber provides excellent grip. There is also a pull-down step under the transom for easy re-entry from the water. The FZR also comes with a remote transmitter that disables the electric-start ignition and also activates Low RPM (learner) mode, limiting the top speed and rpm to prevent new riders accessing full power until they’re ready. To protect the engine the FZR is fitted with a slant detection switch, which immediately stops the engine and oil pumps if the craft overturns. Also included are sacrificial zinc anodes, a high volume intake box (with water-repellent air filter and flame arrestors), and an automatic bilge pump. The powerplant is Yamaha’s 1812cc Super High Output EFI four-stroke, four-cylinder marine engine fitted with an intercooled supercharger. This, combined with the engine management system, provides extreme power as well as good fuel economy and low emissions. The 1812cc engine is billed as the largest displacement engine in a PWC, and is joined by the intercooled supercharger and Yamaha’s Sound Suppression System. Thrust is delivered via a 155mm high-pressure axial flow pump and three-blade stainless steel propeller, fed through a high flow intake duct. The FZR is specified to run on regular unleaded petrol, giving you more bang for your buck. Lubrication is provided via a wet sump system using a scavenging pump to provide consistent lubrication in the high performance range, and resulting in a compact, lightweight engine. Wow! 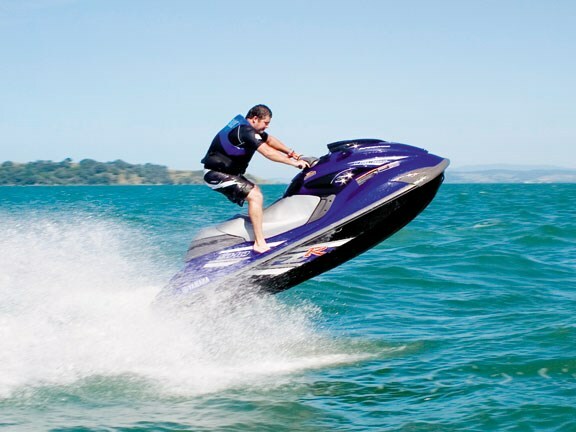 From a standing start the FZR explodes out of the water, reaching top speed breathtakingly quickly. The horsepower and super slippery hull proved to be a potent combination, delivering a top speed of around 70mph. At no stage did I feel out of control. On hard lock and full throttle the agile FZR spins on a dime, and throwing it from edge to edge was both predictable and exhilarating. The FZR is well balanced and a lot of fun. I was waiting for the point where the hull was pushed past it limits and sent me flying, but due to the race-proven design this never came to pass. The electronic throttle is smooth and responsive, and the finely tuned engine purrs like a kitten. Going into the turns the FZR was predictable and responsive and, coupled with the lightning quick acceleration, made for a very enjoyable ride. The seat was comfortable for both the driver and the passenger. It is firm but soft enough to keep the family jewels safe on those harder landings. Overall this is a seriously powerful machine with precise handling and a great ride to match. Combine this with the comfortable seat, eye-catching paintwork, striking gauges and low noise and you have a great looking PWC that’s a pleasure to ride – either on a leisurely cruise or with all guns blazing. 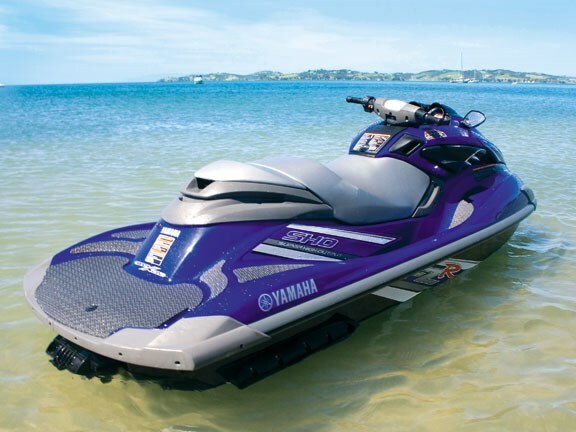 See Yamaha Waverunners for sale. Engine 1812cc Super High Output marine engine. EFI, intercooled, supercharged, four cylinder four-stroke DOHC.